When I decided to stop playing in 2000 I was keen to get into the media business and take my career in a new direction. By chance, one morning, I had a call from the now Sky Sports commentator Robert Lee, who at the time was working for Talk Sport Radio. They were looking for an On Course Commentator and after an interview in London I was subsequently offered seven tournaments throughout the season. During my time with Talk Sport Radio I was approached to do commentating for World Feed who, as the name implies, broadcast all over the world. That led to my being asked to go for a voice test for the BBC where I was offered an On Course Commentary position for the World Match Play Championship and subsequent BBC golf events over the next few years. In addition to this I have also worked for the American broadcaster, The Golf Channel. The following season I started doing some work in the studio for Sky Sports. In recent times I became a regular guest on both Sky Sports News and Sky Sports Golf Night. 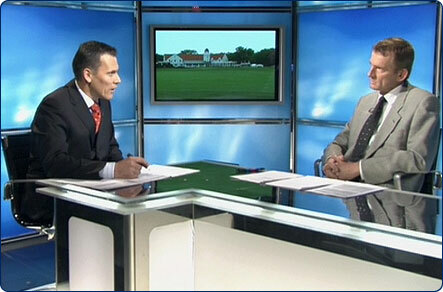 You can currently see me as a regular studio guest on Sky Sports USPGA Tour Golf. You can hear me every week from Tuesday, alongside Sky Sports own Robert Lee on the European Tour podcast. Robert and I review the previous week's action and news, as well as looking forward to the week's coming events on the European Tour, the Challenge Tour and the Seniors Tour.